COPASO is an advanced color palette tool that helps you create the perfect color schemes and themes. With a scratch pad to save colors you’re working with, a photo tool to extract colors and an advanced color picker and color theory wheel to give you tons of color inspiration. Using COPASO you can save your palettes to a private folder or download them to your local computer. 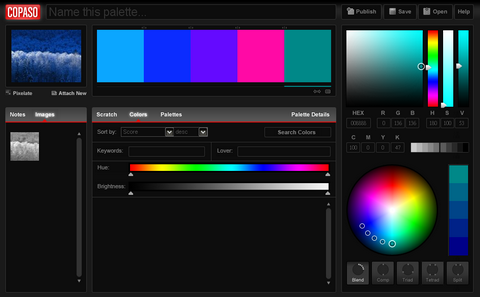 When you’re ready, click publish and share your color palette with thousands of other color enthusiasts. This tool is very easy to use and it has all the necessary functions for color lovers. You can easily build a really nice color schemes for your websites. I’ve been trying to find a good one for a while. OMG,this is what I really want to have!